Worn high on the back, allows access to chalk bag and harness, limited load carrying capability, intended for day use. e.g. Granite 16. 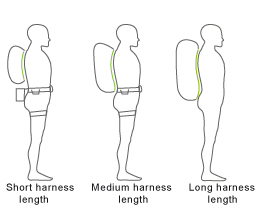 Long harness lengths with adjustable length are typically used in trekking packs which do not currently form part of the Podsacs range. Podsacs specialise in the design and production of climbing and mountaineering packs with short and medium back lengths suitable for technical mountain activities.